Jason Momoa is the American actor who has earned his popularity by the roles of Conan in the remake Conan the Barbarian and Khal Drogo in the epic series Game of Thrones based on George R. R. Martin’s book series A Song of Fire and Ice. Today, the actor’s work in the DC universe attracts much attention: Jason played Aquaman in the blockbuster Batman v Superman: Dawn of Justice and continued to develop this character in further movies including the solo project about Aquaman. Joseph Jason Namakaeha was born in 1979 in Honolulu, Hawaii. His father was an indigenous Hawaiian, and the mother had Indian, German, and Irish roots. The boy’s parents did not live together for a long time: the mother and her son moved to Iowa when Jason was a small child. Jason Momoa spent his childhood and youth in Norwalk; he finished school there and entered the college. 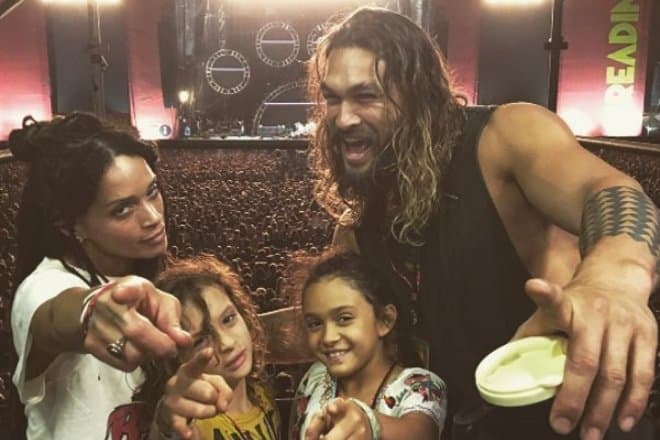 However, in his senior year, Momoa gave up his studies and went to Hawaii: he explained he could not imagine his life without ocean and beach. The man finished his education in one of the prestigious Honolulu colleges. Later, the tall young man started the modeling career: he worked with the Japanese designer Takeo Kobayashi and won the Model of the Year in 1999. In the course of time, he decided to become a movie actor. Jason Momoa debuted in 1999 in the popular series Baywatch; the exotic, handsome man appeared in the tenth and eleventh seasons. One could only be jealous: participation in Baywatch could guarantee fame. There is little wonder that Momoa got a new invitation soon: it was Christopher Erskin’s full-length comedy Johnson Family Vacation. The movie came out in 2004 and received many flattering reviews. However, the real fame came to the Hawaiian actor after he took part in Stargate Atlantis. For five years, Momoa played Ronon Dex in this series. 2007 was marked with the first lead role in Jordan Alan’s Pipeline. Still, the project was not successful. 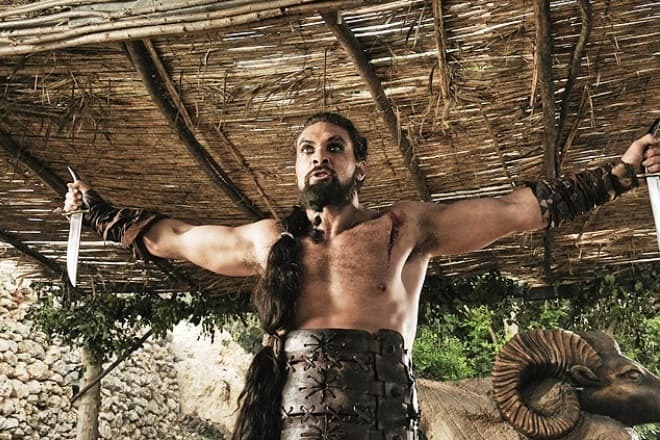 In 2010, the series Game of Thrones and the role of Khal Drogo brought much more fame. After this fantasy series, the Hawaiian rose to stardom. This work was not challenging for Jason. During the auditions, he did not have to deal with lines: he just did the Maori ritual dance. After that, the series producers affirmed his role immediately. Emilia Clarke played the role of the barbarian’s wife Daenerys Targaryen. Unlike his partner, Jason played only in one season of the series according to the storyline. However, fans remembered this role for a long time. After the series appeared on the big screen, it became iconic; in 2011, the actor won the CinemaCon Award for Male Rising Star in Las Vegas. The same year, the remake about the legendary Conan the Barbarian was released. 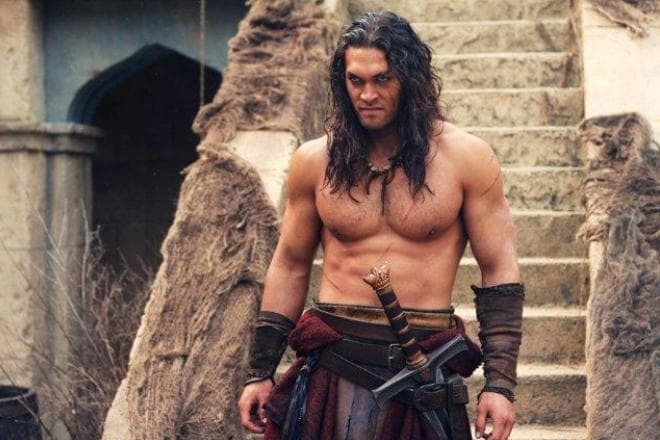 Momoa played Conan’s father and fearless warrior; on the movie set, he had the chance to collaborate with Mickey Rourke. The movie Bullet to the Head starring Sylvester Stallone was one of the most successful projects. Road to Paloma and Wolves which came out in 2013 were also notable. These projects were produced by the company Pride of Gypsies; Jason Momoa was one of the company’s founders. 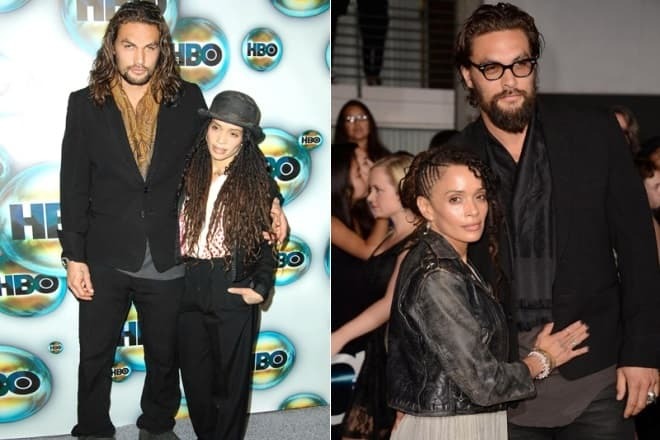 Jason Momoa is married to Lisa Bonet. Their story is exciting: Jason is 12 years younger than Lisa. For the first time, he saw Bonet when he was a teenager and fell in love immediately; it happened when the series The Cosby Show starring Lisa Bonet came out. At that time, Lisa was married to the musician Lenny Kravitz. When Jason and Lisa met, the actress had a daughter. Jason and Lisa look unusual together. While the actor’s height is almost two meters and his weight is 110 kg., his tiny wife’s height is only 157 cm. 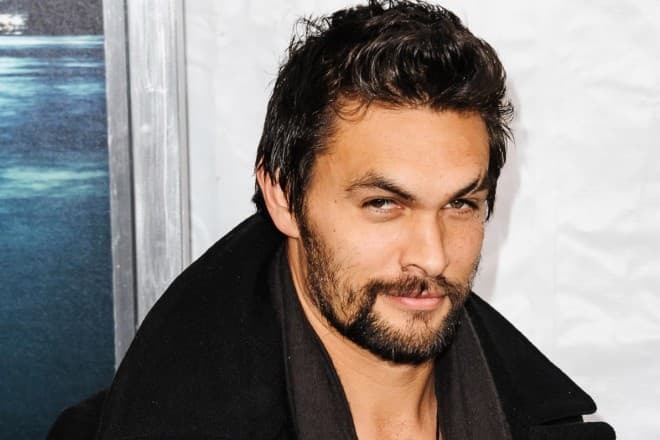 Besides, Momoa’s appearance is brutal; he is both frightening and attractive. Momoa and Bonet make a beautiful couple, and journalists like to take pictures of them. Jason has many tattoos, from traditional Hawaiian triangles to phrases and close people’s names. There is a scar on the actor’s face: it crosses his eyebrow. Some sources claim the man got the scar fighting in a bar; others inform it appeared after the surgery Jason had in his childhood. In 2007, Jason and Lisa’s daughter Lola Iolani was born; the next year, the son Nakoa-Wolf Manakauapo Namakaeha was born. Jason is a Buddhist. He often visits Tibet where he advances his spiritual knowledge. Besides, he likes mountain biking, snowboarding, and roller skating. 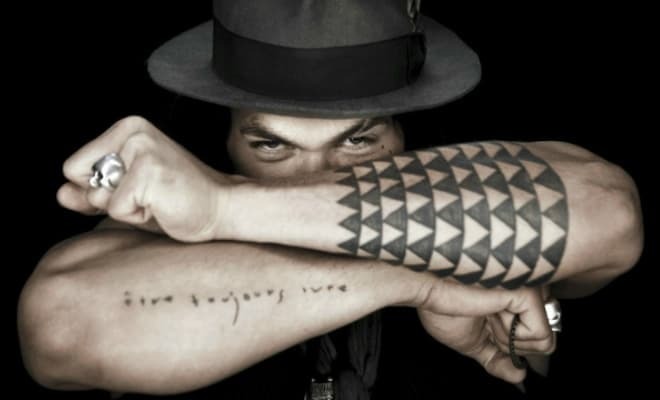 Jason Momoa is fond of painting in his free time; he studied pastel drawing in Paris. There is no TV set in the actor’s house: Jason and Lisa believe it is a useless and even harmful thing for the children. 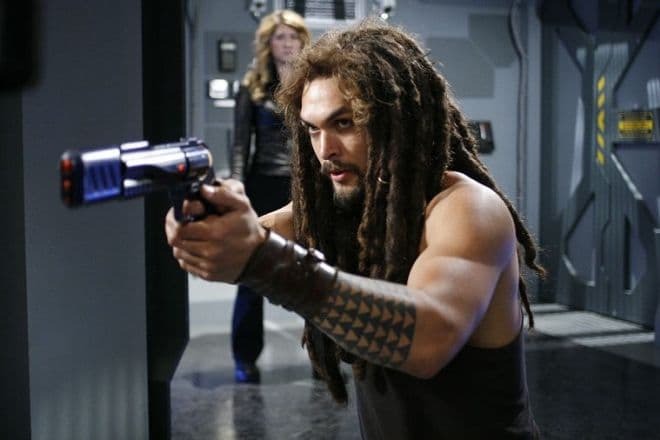 Still, Jason Momoa is good at using modern technologies. The actor has the official Instagram page where 2.3 million users follow him. At the late 2015-early 2016, the teaser trailers and photos with Jason Momoa as Aquaman appeared. It was peculiar that Jason’s image was different from Aquaman in the original DC comics: the character was supposed to be the light-skinned blond with short hair. However, fans welcomed Momoa’s work warmly and appreciated his talent. In March 2016, the action movie Batman v Superman: Dawn of Justice came out; Jason Momoa played the episodic role of Aquaman. It was a kind of preview of the new movie about this superhero. In September 2016, the romantic anti-utopia The Bad Batch was presented at the Venice Film Festival. Momoa played the cannibal who tried to survive in post-apocalyptic America and suddenly fell in love with the person who was supposed to be his food. In October 2016, the global premiere of the comedy action movie Once Upon a Time in Venice starring the actor took place. 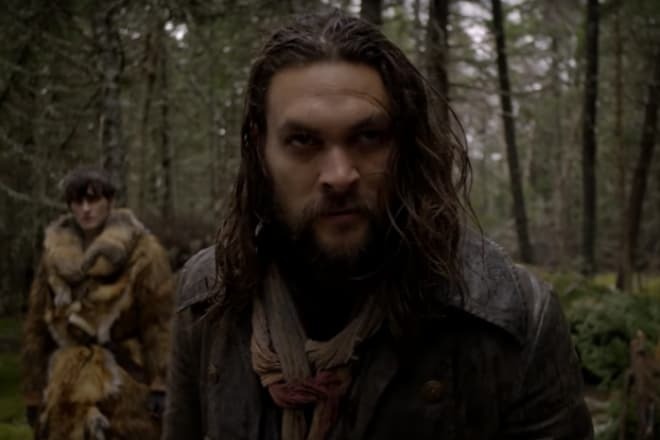 In November 2016, Jason Momoa appeared in the Canadian and American series Frontier telling the story of fur trapping in North America in the early 18th century. The actor played the lead role of Declan Harp, the outlaw who tried to break the Hudson's Bay Company’s monopoly on fur trading in Canada. Jason Momoa continued to work on the image of Aquaman. In 2017, the premiere of Justice League about the ensemble of five DC characters took place. In 2018, the movie Aquaman devoted to the character will appear on the big screen. The next year, Momoa will work on the sequel of the superhero crossover Justice League Part Two. Rumors had it Momoa was going to appear in the movie The Crow, the remake of the mystic action movie under the same title. Journalists claimed Jason had agreed to play Eric Draven, and the production began in January. However, there has been no precise information about the future movie, and promo materials have not been released.